The in vitro micronucleus test is a genotoxicity test for the detection of micronuclei in the cytoplasm of interphase cells. Micronuclei may originate from acentric chromosome fragments (i.e. lacking a centromere), or whole chromosomes that are unable to migrate to the poles during the anaphase stage of cell division. The assay detects the activity of clastogenic and aneugenic test substances in cells that have undergone cell division during or after exposure to the test substance. 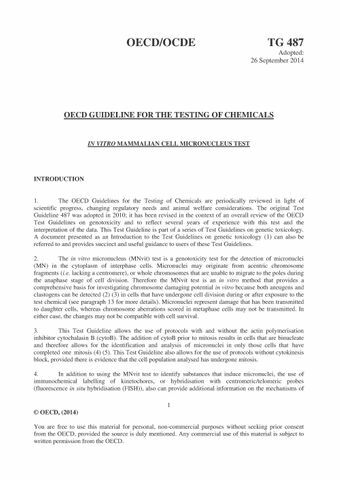 This Test Guideline allows the use of protocols with and without the actin polymerisation inhibitor cytochalasin B. Cytochalasin B allows for the identification and selective analysis of micronucleus frequency in cells that have completed one mitosis, because such cells are binucleate. This Test Guideline also allows the use of protocols without cytokinesis block provided there is evidence that the cell population analysed has undergone mitosis.